Grants from the North Face Explore Fund and Sports 4 Life will help The Mountaineers use the power of the outdoor experience to transform the lives of underserved teen girls. We're thrilled to announce we've received two grants to help us use the power of the outdoor experience to transform the lives of underserved teen girls. The North Face Explore Fund awarded a $9,000 grant to our Mountain Workshops partnership with Young Women Empowered (Y-WE), and Sports 4 Life awarded a $5,000 grant to fund indoor and outdoor climbing activities for both Y-WE and Beacon Interagency's Climbing Challenge Series. The North Face Explore Fund encourages participants to experience outdoor activities and develop an enduring appreciation of the outdoors - a mission that fits well with The Mountaineers. In 2016, the Explore Fund helped The Mountaineers launch a partnership with Young Women Empowered (Y-WE) to support Y-WE's Nature Connections program, which the renewed support will help us continue. Y-WE provides mentorship and empowerment programs for teen women in Seattle - 70% of Y-WE youth are immigrants to the US and 80% are women of color - and the Nature Connections program provides year-long outdoor experiences ranging from wilderness first aid to snowshoeing and multi-day backpack trips. Last year, we brought the Y-WE girls to the North Cascades to provide these life-changing outdoor experiences. By spending time outside with mentors, the young women of Y-WE learn about the natural world and build resiliency, confidence and other important life skills. The Sports 4 Life grant award from the Women's Sports Foundation will also support the Y-WE program and our partnership with Interagency High School in Beacon Hill. The Women’s Sports Foundation was founded in 1974 by tennis legend Billie Jean King, and is dedicated to creating leaders by ensuring all girls have access to sports. The Sports 4 Life grant seeks to increase the participation and retention of African-American and Hispanic girls, ages 11-18, in developmental youth sports programs. The Sports 4 Life grant will support our Mountain Workshops partnership with Interagency High School at Beacon Hill to serve young women whose academic success has been been hindered by serious challenges, including homelessness, abuse, poverty, and the disruptions of the foster system. Together, The Mountaineers, Interagency, and the Teen Health Clinic (sponsored by Kaiser Permanente) developed The Climbing Challenge Series to provide students with much needed physical education credits and to address life skills like increasing self-confidence and building trust and communication skills in the young womens' daily lives. We are so grateful to The North Face and Women's Sports Foundation for their support! Our Mountain Workshops with Y-WE and Interagency are an important part of how The Mountaineers transform lives through outdoor experiences. The sustained and committed nature of these partnerships provide extended opportunities for young people to learn important skills in the outdoors within the context of their own communities. Studies have shown that underserved and minority youth who are exposed to Environmental Integrated Context (EIC) learnings perform better on standardized tests, participate more fully, and are more engaged in the classroom than youth who do not. 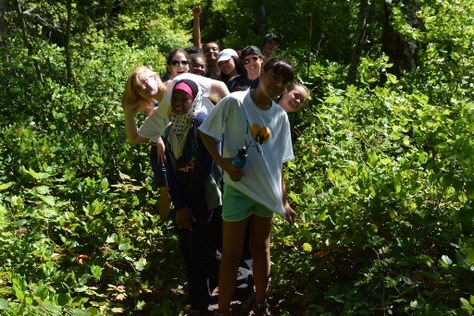 Over the course of our 2016 partnership with Y-WE, the Nature Connections program saw a 20% increase in students who reported a sense of confidence in their ability to accomplish new and challenging activities. Funds from the North Face Explore Fund and Sports 4 Life will be combined with contributions from Mountaineers members and with funds from the Mountaineers Access Program (MAP), a scholarship fund that subsidizes individuals and groups who otherwise would not be able to afford to participate. MAP funds come from our generous donors, corporate sponsors, and foundations. To make a donation to support programs at The Mountaineers that make a difference by transforming lives, please give here.